Theater in the Now: Review: Poetry Is...? When you have a talented group of friends, you're bound to want to collaborate with them. And that is the root of Summer Blue's creation. Conceived by director Akil “Apollo” Davis and featuring a multi-talented, multi-ethnic company, Summer Blue is essentially a talent show. 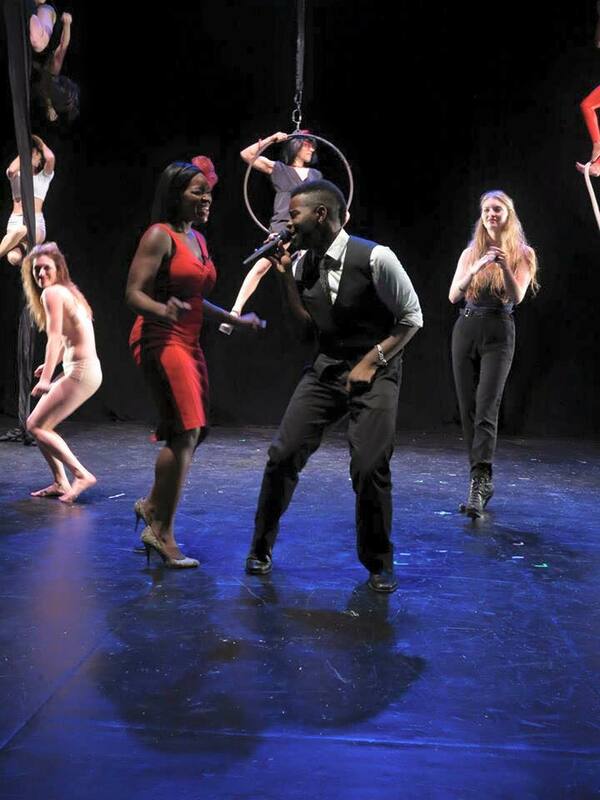 With a mix of music, poetry, dance, and aerialists, Summer Blue has a thin line of continuity: social issues. With no overlying arc to truly speak of, much of the piece falls onto Davis and discovering the answer to "why". Davis has a nice idea of compiling these pieces but when it comes to direction and planning, Davis did a poor job. There was little reason to jump from piece to piece. And without a professional rigger, when using the aerial items, they had to remain down on stage. In Act I, we get a fascinating number with Dana Abrassart performing on a chain to an interview. The piece itself was problematic with random blackouts occurring to cover lack of diverse material and no story through the aerial work, but Davis placed it so early in the show that the chain and silk was hanging the entire time, creating terrible visibility for the audience. Davis staged most of the numbers so far downstage and toward the center section that if you were on the sides of the three-quarter thrust stage, you saw nothing but backs. One way to avoid this would have been by Davis taking himself out of the performance company and solely in the director's seat to observe. The majority of the individual bits were stunning but there was one that felt completely misplaced. And that was the gender-bending Taming of the Shrew scene. The thesis was interesting but it had little business being thrust into this dance and music celebration. The ensemble featured so many talented performers but there were two that stood out from the rest. First was Delano Montgomery, the funk mater on guitar. As composer and music lead, Montgomery provided an essential soul to the piece. Even when he got a moment to take off the guitar strap and offer some acting, he did it with charm and style. The other stand out was Elana Jaroff. Jaroff performed two parts of a dance piece that was simply astonishing. Jaroff stripped away everything to offer a raw and beautiful performance. Shows in Las Vegas tend to last no more than 90 minutes. And this variety show would benefit from following that model. Once Davis discovers ways to bring continuity and forecasting to the piece, it will certainly arouse more audiences.